My neighbor brought me some figs today that he picked from his tree. And what a coincidence it’s this weeks Secret Ingredient which is being hosted by Guilty Kitchen. 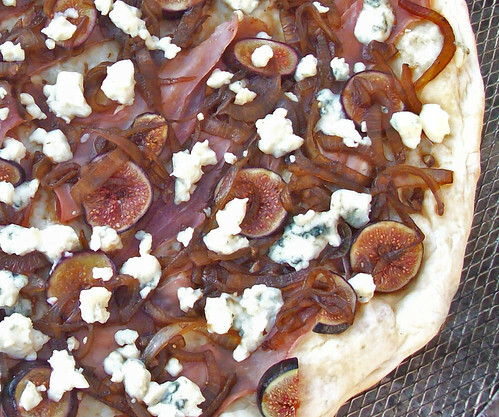 I was trying to decide what to do with them and I remembered a pizza we had at McCormick and Schmick’s a while back that had figs and blue cheese. I have to say this pizza was soooo good my arm hurts from patting myself on the back….Emma had a piece and said it was good but opted for the left over ribs after that. Sean and I scarfed the rest!!! I had some frozen foccacia bread in the freezer that I used for the dough. I rolled it out very thin and placed it on my pizza pan and grilled it for about 3-5 minutes. 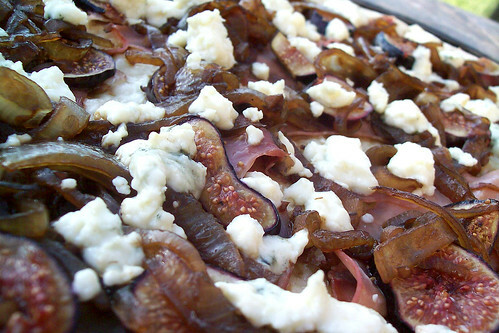 I took it off, brushed with olive oil and added the topping ingredients. I then placed it back on the grill for about 8 minutes. The balsamic onions were the key, they were delicious. This is definitely a pizza we will make again. Grill until brown for approximately 10 minutes. Heat the oil in a large sauté pan and sauté onions until lightly browned. Add thyme and garlic. Cook for a minute until incorporated. Add the honey and then the vinegar. Cook until the onions are well cooked and the vinegar is reduced should cook down to 1 cup of sauce. Season with salt and pepper to taste. This looked so good – I was bound and determined to make it – found the figs – got the dough – was about to pick up the Blue Cheese and forgot John HATES it and he doesn’t care for the texture of figs (except in Newtons) for some reason I forgot that I dislike proscuito – then I realized maybe this wasn’t for us – but damn – it looks/sounds good! I’m not big on figs either. Except when an old colleague paid a foreign national to eat a hockey puck size pack of dried figs. Poor guy was running to the bathroom all afternoon. Hilarious. How can you not like prosciutto? What a great flavour combo on that pizza!